It’s a common expression really, a mountain being posed as the grammatical expression of an immovable object; one can’t move a mountain after all. With our home on our backs we step by step implant our existence into wilderness grand, imposing and immovable. Burdened with everything we need for shelter and survival brings with us a heightened disconnect with civilisation that rapidly seems so far away. Embracing the independence that camping in the wild delivers makes for a far more simple view of our world, no longer a complex network of supports but refined into a hermit crab like sack that clings to our backs. We set off for a short camping trip, not the embracing of a new lifestyle but in this small slice of time we are afforded a view into a window that we so rarely otherwise do, self reliance. In Freudian terms the need to feel independent is an irresistible one, fitting that it takes place amongst the immovable. Temporarily hijacking our journey into self we share the path with a rather inconveniently noisy group, some people seem just unable to moderate volume. Slowing down to let them go ahead, speeding up to get ahead of them they seem to always just appear wherever we are, a challenge in adopting the headspace we seek. For the most part we do shake them free and enjoy a rare cloudless sky in the charge towards Fitz Roy. This granite spire is similar in geological terms to the likes of Cerro Torre and Torres Del Paine but where those other famous rocks are slender spires, Fitz Roy bucks the trend with swelling girth and immensity. Granite spires are more commonly famous for their dramatic looking tower quality, not usually a mountain in their own right, immovable and immense. 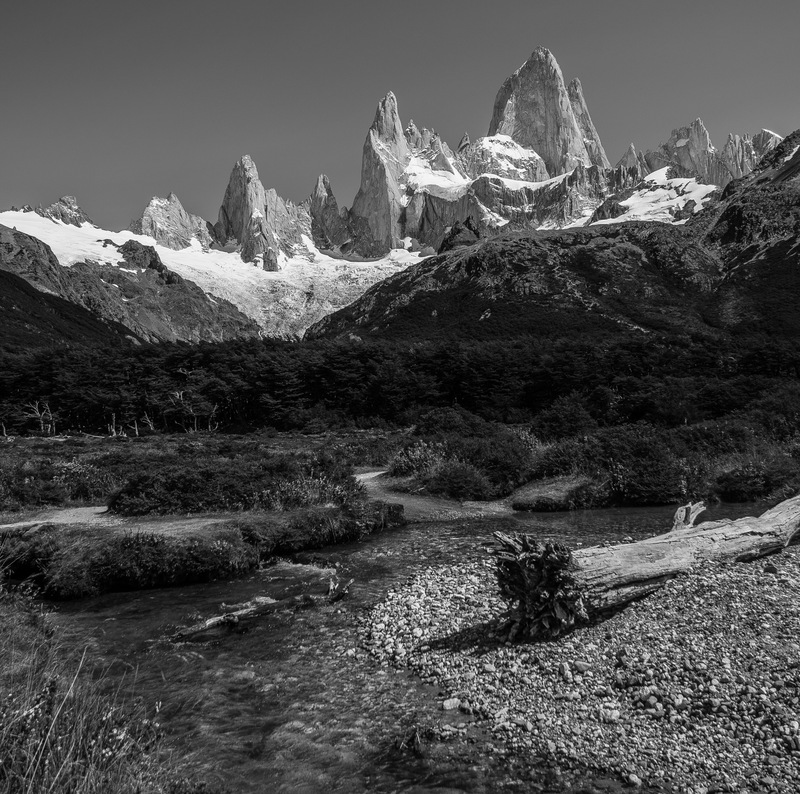 Through contorted windswept beech forests, skirting lakes and streams we catch regular shots of Fitz Roy and surrounding cohorts, a cordon of soldiers in mountainous uniform. Capturing much of the characteristics of Torre we see densely packed snow and ice surrounded by mountains, grand on any other occasion now supplicant in their relative diminutiveness below Fitz Roy. The day is also a cracker, sun beams down on us illuminating the flora that paints this landscape with more diverse vistas than the limited plant variation should generally allow. 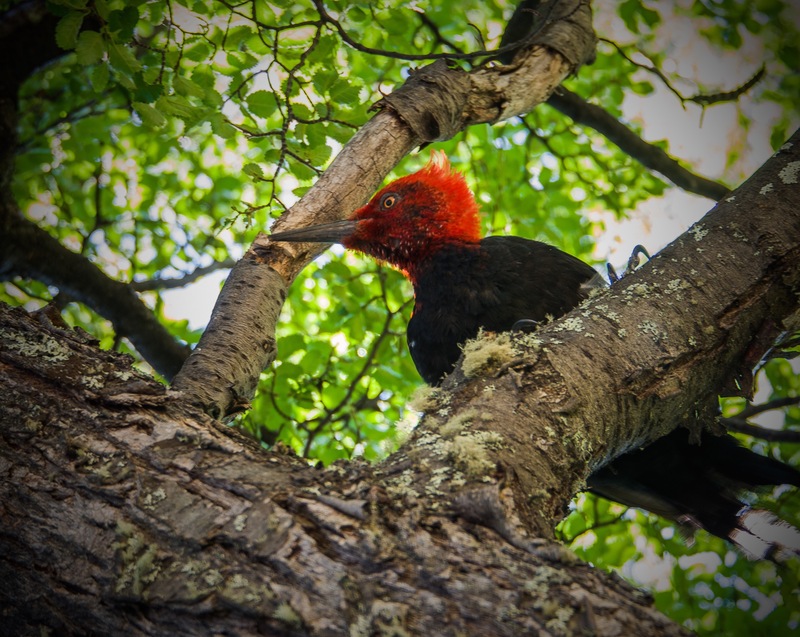 Stopping along the way to spy up close to a family of woodpeckers ripping into the trees is quite a surprise, this harsh climate delivering beautiful things at every turn. After a relatively easy walk we pull up and make our home in the midst of one of the grander beech forests we’ve seen, sheltered from the sun and wind, that Patagonian wind relentless and ripping just never stops. Of course the annoying group turns up but blessedly their superficiality matches their length of stay, peace at last. With the world now a world away whims so often pushed aside come to the fore, a little nap is in order simply because we feel like it and there’s no telephone, alarm or outside noise to challenge the indulgence. The late sunsets here mean we have a bit of exploring time after the nap, so it’s off to Glacier Piedras Blancas. 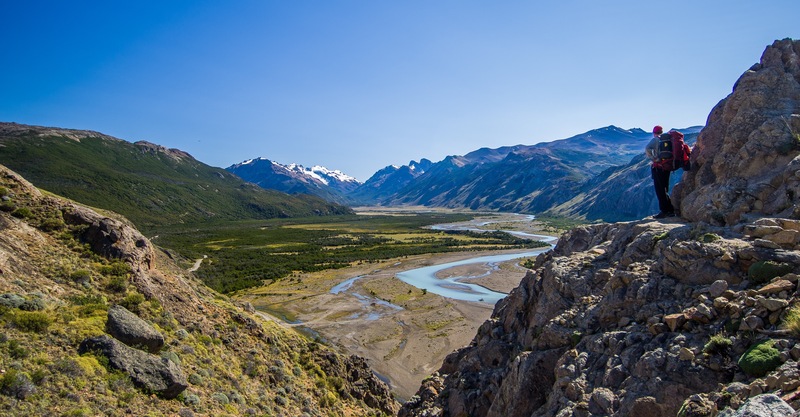 We’re not sure how this could possibly stack up to Perito Moreno but it’s a great day and in this environment a little exploration would be criminal to not do. Over a boulder wasteland we clamber to sit ashore a typically stunning glacial melt lake, you know the drill, awesome, beautiful and the rest. 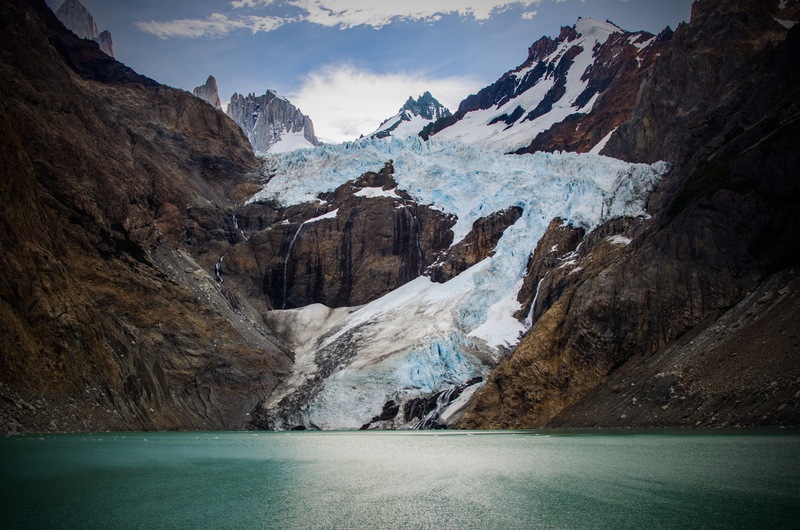 This glacier is of course a speck in comparison to Perito Moreno but it does have a fantastic cascading quality as it’s frozen halt dances down the layers of bedrock, a waterfall in frozen time. It’s this quality of movement that is so captivating in a glacier, particularly this one, smoother upper reaches crush and shatter together in a violent flow of racing non-motion. Cradled in an amphitheatre created by the former rage of this glacier we cannot escape an appreciation for the power on display, a constant roar occupies the surrounds as the glacier contorts itself in movement. An age of flowing gouges the mountain to create the theatre while the star of the show retreats back to occupy the stage alone. It’s a powerful display, in nature we see in one view the immovable object and the irresistible force; the glacier pushing aside mountains while having to concede it’s stubborn direction at the unbreakable resistance of the mountain bedrock. Although not a big glacier it’s a humbling display that indeed it is possible to move a mountain; likewise to resist the irresistible. An expanding premise for thought in an escape from the limiting world; here is where mountains are moved in more ways than one.